Welcome to the June 2016 Newsletter from Hawk Miniatures. After two very successful shows recently, both the £Welling Show and the BMSS show, we have been busy reading our new releases. More details to follow regarding these though we are hoping to have sample castings soon. Our range of Kolinsky Sable Paint Brushes have been well received by our customers and we are proud to announce that we are expaning the range. We are now able to offer Flat Brushes and Angluar Liner Brushes, made of the same high quality Kolinsky Sable bristles, in a range of sizes suitable for modellers and best of all at the same competitive prices. These are now available from our website or at any of the shows we are attending. If you have been following us on Facebook or PlanetFigure then you would have seen that we are currently running a special offer on our 150mm Figure (£39.95) and 1/12th Bust (£19.95) of Vice Admiral Nelson which runs until the end of May. 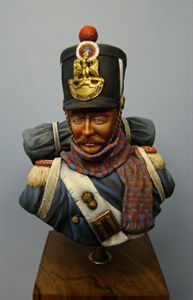 The new bust, from our Black Eagle range, of a French: Old Guard Sapper is now at the casters and will be released at Euro. We also have two new figures being release at Euro this year. More details to follow soon. Date: 11th June 2016 at Hawkinge Community Centre, Heron Forstal Avenue, Hawkinge, Folkestone, Kent, CT18 7FP. Date: 2nd June 2016 at Alexander Centre, 15-17 Preston Street, Faversham, Kent, ME13 8NY.